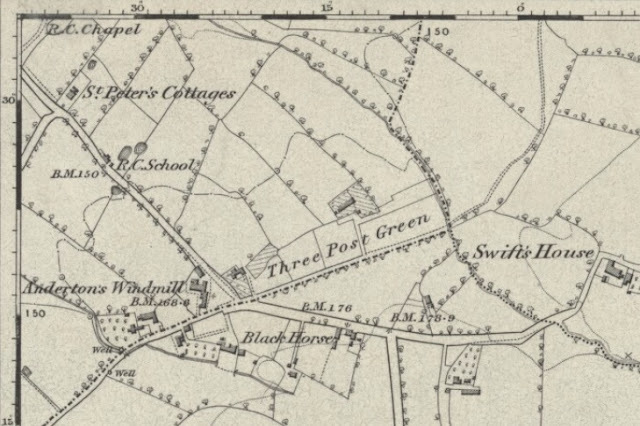 The Black Horse was located to the south east of Mawdesley on Bentley Lane in Wrightington in the Three Post Green area. 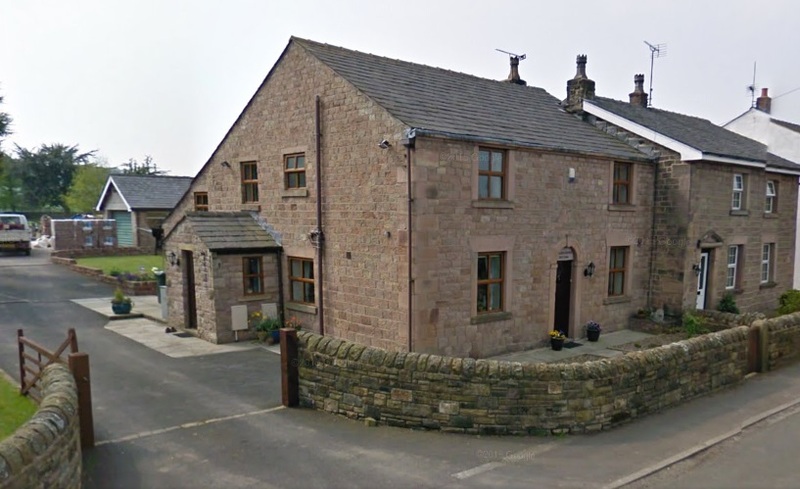 It is a private residence today called "Black Horse Cottage", as shown above but operated as a hotel/Inn in the early to mid-1800s. Road names varied over the decades on the census returns below although for a long time it was the adjacent property to the church on the enumerator's route so easily identifiable. The name Black Horse would have been linked to the rural location and farming in the area. Listed landlords and beer sellers at the Black Horse were Thomas Bentham (1851), Humphrey Foy (1861) and Johnson Solloway (1867). 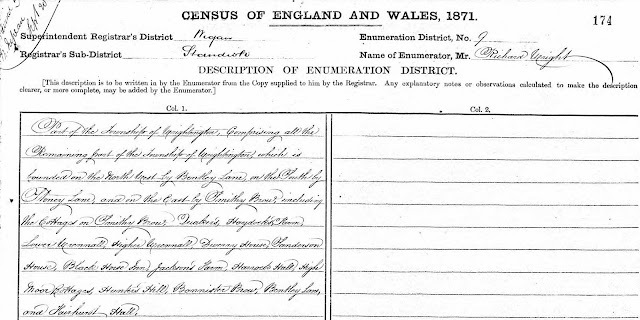 Ten years later in 1861 the census enumerator does not record the name of the Black Horse but a Humphrey Foy is shown as a beer seller at Anderson's Mill. 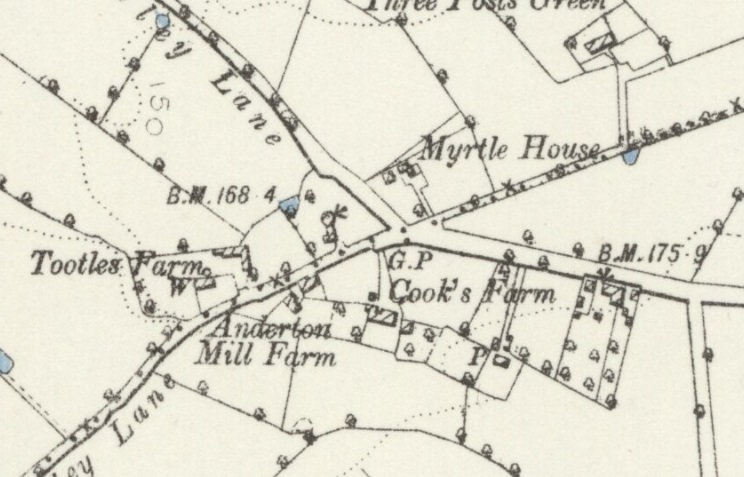 There were numerous properties in the area of the Anderson Windmill (including the Black Horse) that were predominantly occupied by farm labourers and their families whose location is referred to as Anderson's Mill, so I suspect that Humphrey Foy was resident in the Black Horse at this time. 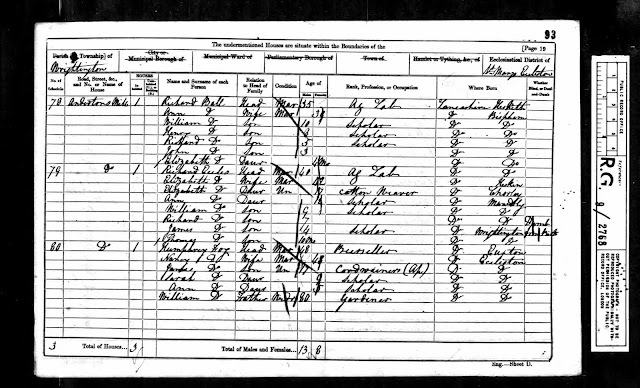 Johnson Solloway, a local man from Eccleston took over the pub sometime in the 1860's but following the death of his wife Lucy in 1867 he moved back to Eccleston where he is shown on later censuses working as a grocer. 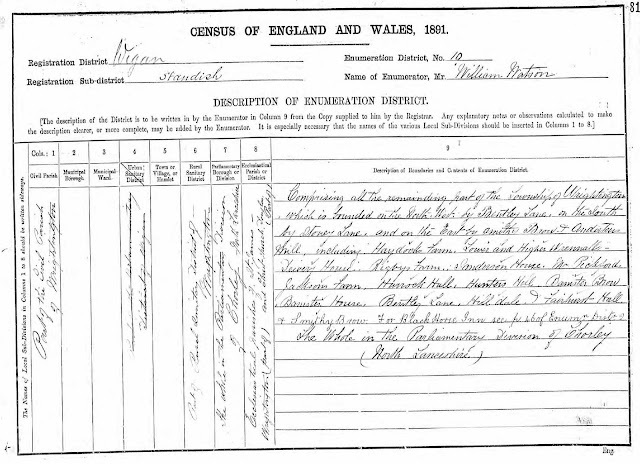 There is no trace of the Black Horse on census records or maps after Johnson Solloway's departure although it is referred to in the census summary in the 1871 and 1891 census records but probably just as a well-known local landmark as the Inn seems to have been closed by this time. Looking at a map c.1894 below the building is still clearly marked but there is no mention of an Inn and it seems to have closed its doors for good and reverted to farming. 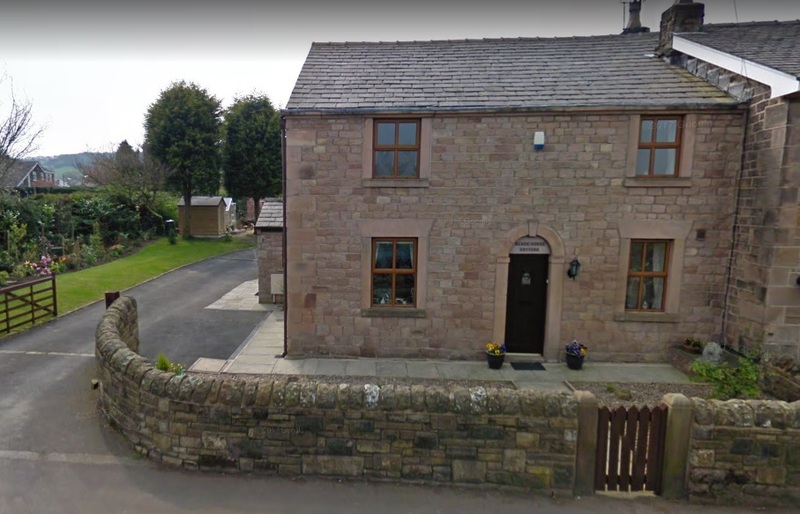 The Clyde Arms was at the other end of Ridley Lane (on the corner of Back Lane) to the Black Horse, which was just over the border in Wrightington. The boundaey runs along part of Bentley Lane. 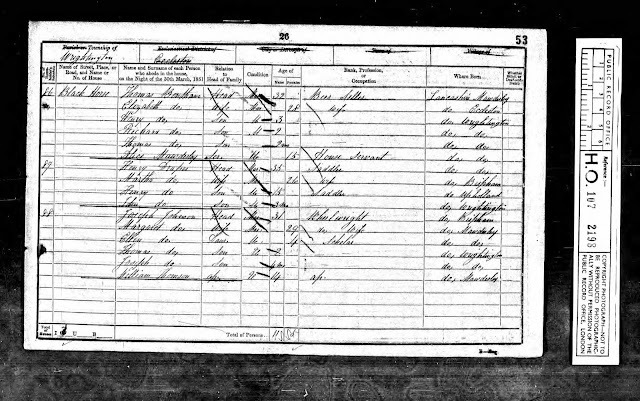 I found the Black Horse in 1861 (RG9/2768 folio 93 page 19) when Humphrey Fox is a beerseller. 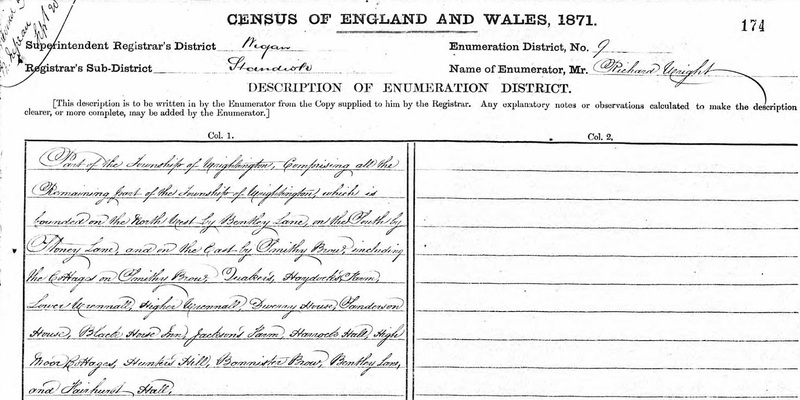 I have not located it in 1871, but in 1881 (RG11/4222 folio 59 page 37) Hugh Glover is Publican and Corn Miller. 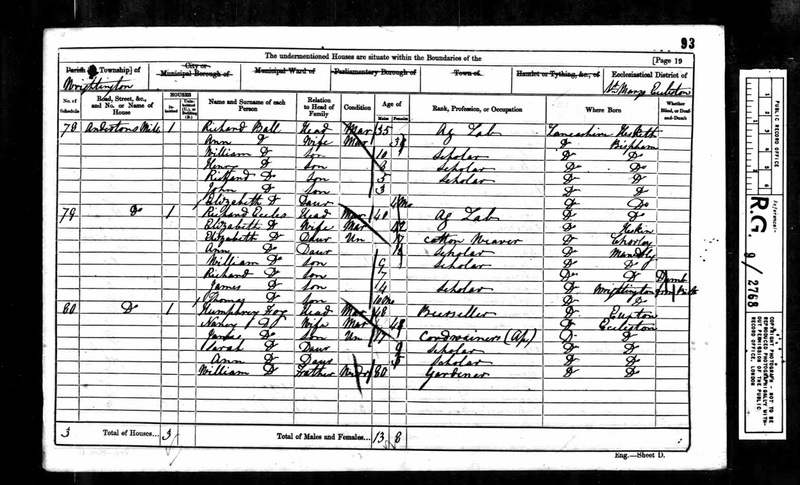 Johnson Solloway, born 1801 in Eccleston, was a groom who worked at big houses in Staffordshire and Warwickshire, eventually becoming a coachman. Lucy was actually the sister of his second wife, Elizabeth Craddock. They never married. 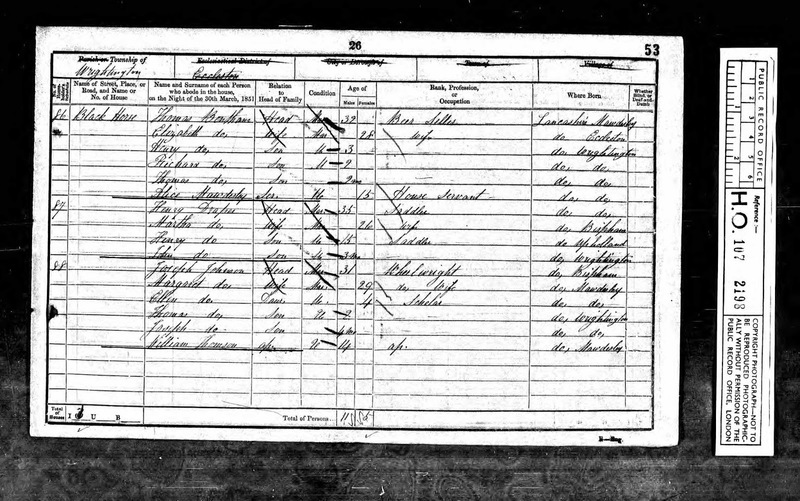 In 1871 he was staying with his daughter Mary Ann, who had married her first cousin, also Johnson Solloway. 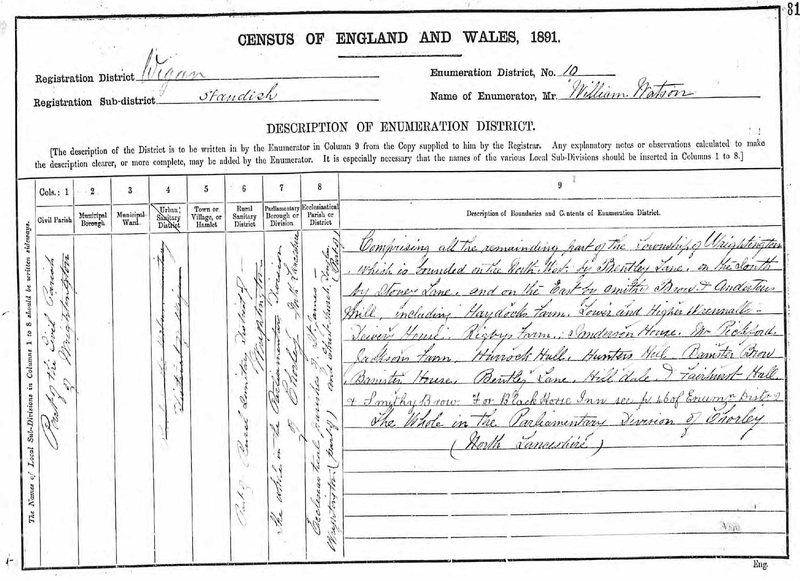 By 1881, Johnson senior had left a job as coachman in Lincolnshire and was in Spilsby Union Workhouse, where he died. Thanks Andrew - I had been confused about the Black Horse and Clyde Arms being the same property so have added another page for the Clyde Arms. I do believe Hugh Glover was the landlord at the Clyde Arms rather than the Black Horse from reviewing it further but still need to do some work on the history.